The business or Marsonetto was first established by Mario Marsonetto in 1946 as a coach building concern. It was located in Villeurbanne which is one of the larger suburbs of Lyon. Marsonetto dedicated the company to the successful creation of special bodies for industrial vehicles, and in doing so achieving important know-how in the construction of load-bearing frames and superstructures for vehicles. His first complete car was the Luciole, a small fibreglass bodied sports coupe in either FWD configuration using the Panhard Dyna Z mechanicals, or Rear-Engine RW Drive using the Renault 4CV. These cars were first presented at the 1958 Paris Salon. These were followed in 1965 by the Mars 1 which used a tubular frame and the mechanical parts from a Renault R8. To achieve this Marsonetto reversed the engine position to the front and turning it around to make a mid-front engine FWD car. Next came the 1600 GT in 1968. It was a development of the Mars 1 concept but with Renault 16 TS running gear up front. 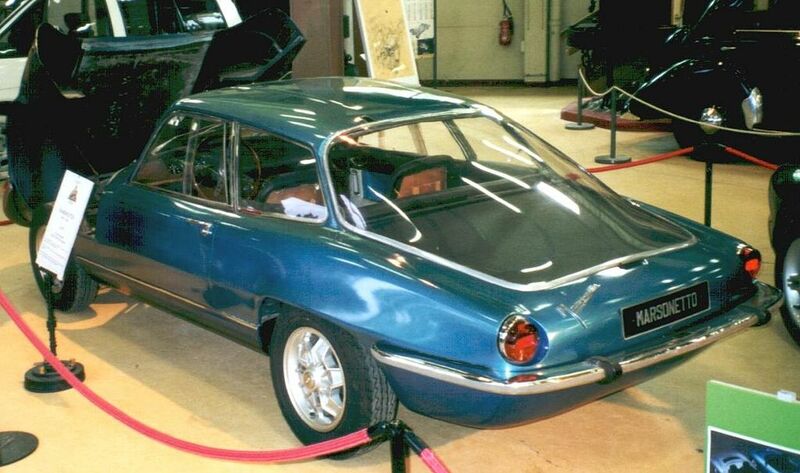 This car also featured a large rear hatch-window, predating the Renault Fuego and others by some years. The car was light and featured 4-wheel disc brakes. His last model was R25 based; again FWD and with the family resemblance to the two previous models. Not much has been written on this car. I believe the last of these was built in 1972. However, Marsonetto continues as a family concern selling new Italian production cars.